A few months ago, my husband’s company founders moved down to Santiago, Chile to join an incubator program for tech startups. Every day on their calls, Kevin gets a new update on the long hours they are working and–unfortunately–how they haven’t had much time to get out and explore. We are glad they are working hard to get the company off the ground, but I’d love to see them get out and experience the city. I have great memories from our 2012 visit to Santiago–the markets, the history, and most importantly, the food. One of our favorite culinary memories was a popular white wine cocktail called a terremoto, which is Spanish for “earthquake.” Like California, the Andean countries are famous for their temblors, and the drink was supposedly created in the days after a major earthquake hit in 1985. 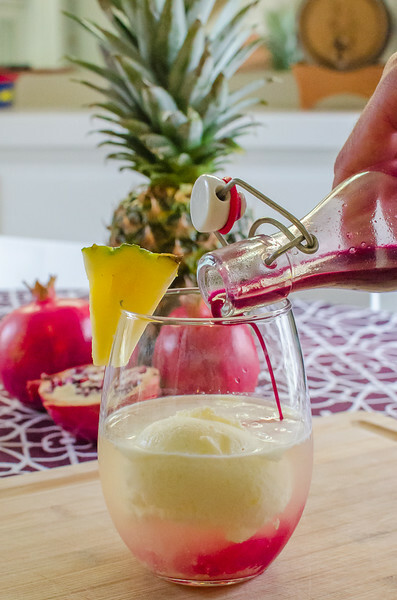 The terremoto recipe includes a young, fortified white wine (called pipeño), sugar, pineapple ice cream, and either grenadine (sweet pomegranate reduction) or a herb liquor like fernet. We first tried a terremoto at Santiago’s famous La Piojera bar and later at a neighborhood dive in Valparaiso. For years, I’ve been wanting to recreate the drink. 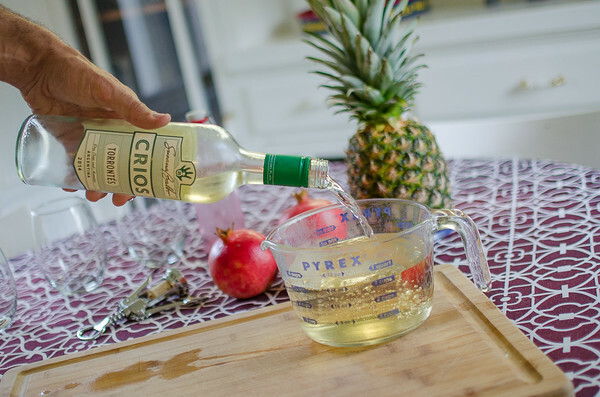 So when Crios, a family-owned wine brand from Argentina asked me to come up with a travel-related recipe using one of their wines, here’s my chance! Crios is a family-owned brand by Susana Balbo, one of Argentina’s leading and most innovative winemakers. In Spanish, the word crios means “offspring” and was created by Susana as a tribute to her son, Jose, and her daughter, Ana. Nowadays, Susana’s children have joined the family business and add their younger perspective to the wine. Crios wines are harvested from specific areas in Mendoza and Salta in Argentina, where grapes are optimal for a fruit-forward style. Every Crios wine carries an inspirational message that also represents either a milestone in Susana’s personal or professional life or the story about how the wine was made. I read the descriptions they forwarded me their various wines and the Crios Torrontés looked like it would fit the terremoto–its inspiration message is “break the rules.” The Torrontés was described as a dry crisp and aromatic white wine with crisp notes of white flower, pear, and ripe peach. 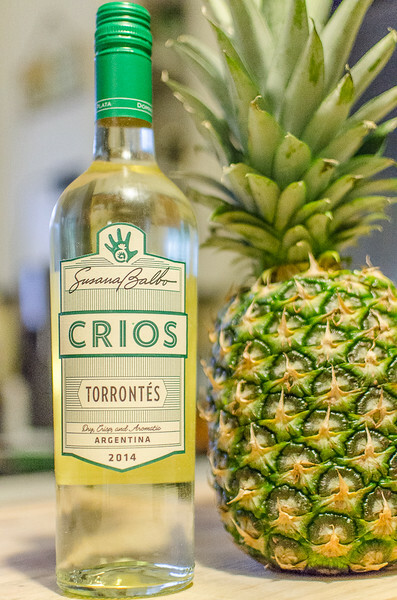 In the past, Torrontés was a common blending grape, but Crios’ winemaker Susana Balbo transformed it into Argentina’s star white wine. They say the wine pairs well with smoked meats, medium cheeses, fish, crab, and sushi. You can’t find pipeño in the U.S., so instead, you can mix a crisp white wine (like Crios Torrontés) with a South American grape brandy called pisco, to get the fortified effect. It’s fall, it’s pomegranate season, and pomegranate is pretty much the perfect fruit, so use homemade grenadine (sweet pomegranate syrup) if you can. I pinned a great recipe here. 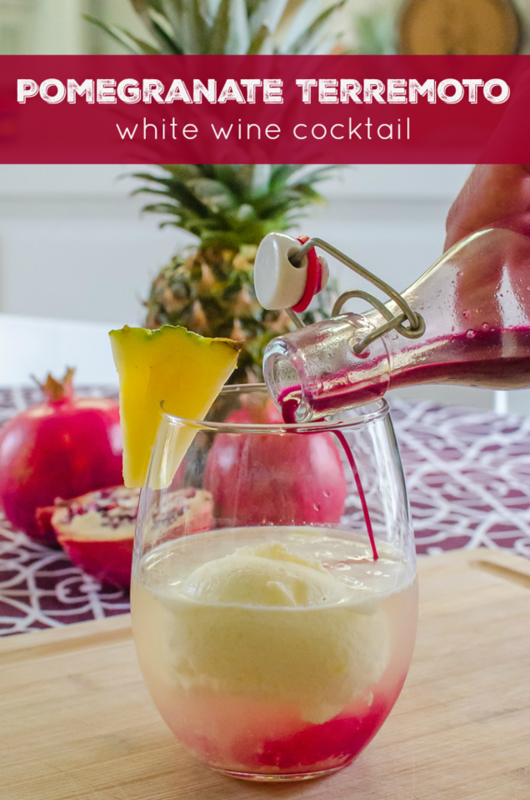 A terremoto typically has a lot of added sugar, but I cut that out of this recipe and think it tastes much better that way–it also lets you appreciate the quality of the wine. If you tend to like your drinks on the sweeter side, mix up to a tablespoon of sugar into the wine/pisco mix for each glass. Here’s my new and improved fall-friendly pomegranate terremoto recipe, that’s (in my unbiased opinion) even better than the ones we tried in South America. Let me know what you think! 4 tbsp grenadine, homemade if possible--this is a good recipe. Pour the bottle of chilled white wine into a pitcher. Add the pisco and stir. Fill each wine glass about half full with the boozy mixture. Take a large scoop of pineapple ice cream, and gently place it in the glass. Drizzle it with about a tablespoon of the grenadine. Serve immediately.